During May’s annual observance of Hepatitis Awareness Month, May 19th will be recognized as the first-ever Hepatitis Testing Day in the United States. The Action Plan for the Prevention, Care, and Treatment of Viral Hepatitis (Action Plan) called for the establishment of this national testing day as one of the important actions to be taken to address the fact that millions of Americans have chronic hepatitis, but most of them do not know they are infected. Establishing this national testing day offers federal partners, as well as colleagues in media, state and local government, community-based organizations and industry, important opportunities to educate both the public and healthcare providers about the silent epidemic of viral hepatitis in the United States. Since chronic hepatitis often does not cause any symptoms until serious liver damage has taken place, testing for hepatitis is crucial. Testing can increase the number of individuals diagnosed and linked to treatment and other needed services that can prevent hepatitis related disease and deaths. Too many communities and populations remain uninformed about the facts of viral hepatitis, including associated adverse health effects, the need for testing and care, and steps that can be taken to maintain health, including the availability of new and improved treatments. Hepatitis, which is a general term describing inflammation of the liver, can be caused by several different viruses. In the United States, the most common types of viral hepatitis are hepatitis A, hepatitis B and hepatitis C. Unlike hepatitis A, which does not cause a long-term infection, hepatitis B and hepatitis C can become chronic, life-long infections. Chronic viral hepatitis can lead to serious liver problems including liver cancer. More than 4 million Americans are living with chronic hepatitis B or chronic hepatitis C in the United States, but most do not know they are infected. Both hepatitis B and hepatitis C can cause liver cancer and have contributed to the increase in rates of liver cancer in recent decades. At least half of new cases of liver cancer are from chronic hepatitis C.
Among the populations most affected with chronic hepatitis B are Asian/Pacific Islanders. The populations most affected by chronic hepatitis C are are African Americans, persons living with HIV, current and former users of injection drugs, and baby boomers (persons born during 1945-1965). Early detection of chronic viral hepatitis infection can save lives. Many people can get care and treatment that can limit disease progression, prevent cancer deaths, and help break the cycle of unknowingly transmitting the virus to others. Hepatitis Risk Assessment: Find out if you should be tested by taking a 5-minute online Hepatitis Risk Assessment. This brief online Hepatitis Risk Assessment allows individuals to determine their risk for viral hepatitis by answering questions privately, either in their home or a health care setting. They can then print tailored recommendations based on CDC’s testing and vaccination guidelines for viral hepatitis to discuss with their doctor. Try the Hepatitis Risk Assessment out for yourself! We hope you’ll help us spread the word about the tool by downloading free Hepatitis Risk Assessment web buttons and badges to feature on your website and by sending out the online health e-card to your friends, colleagues and/or patients. Hepatitis Testing Day Event Page: Check out the new Hepatitis Testing Day Event Page to find testing events across the U.S. If you are hosting an event, please help us build our inventory of hepatitis testing resources by registering your Hepatitis Testing Day event today. Know More Hepatitis Campaign: The Know More Hepatitis Campaign aims to decrease the burden of chronic hepatitis C by increasing awareness about this hidden epidemic and encouraging people who may be chronically infected to get tested. 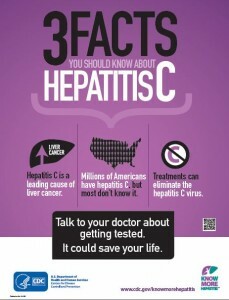 Download new, free campaign posters, testing fact sheets for use during Hepatitis Awareness Month and beyond. New Hepatitis B Poster: In a new, free, downloadable poster, Dr. Howard Koh, Assistant Secretary for Health, encourages Asian Americans to get tested for chronic hepatitis B. Hepatitis Downloadable Materials Inventory: Federal partners working to implement the Action Plan have collaborated with CDC’s National Prevention Information Network (NPIN) to compile an inventory of the available viral hepatitis education materials for both the public and healthcare providers. These are now available in the NPIN searchable materials database. The materials in the database are available, free of charge, to anyone via a link on a website. Database materials include downloadable fact sheets, PDFs of posters, training manuals, webinars, and other materials. We are pleased that many of our federal partners in the Action Plan—including the Indian Health Service, the Substance Abuse and Mental Health Services Administration, and the Department of Veterans Affairs—are already disseminating these tools to their staff, grantees, providers, and other stakeholders. Please join us in making use of these tools and sharing them with others who might also find them helpful. Together we can make this inaugural Hepatitis Testing Day a great success by raising awareness of viral hepatitis and encouraging testing for those who may be chronically infected.